Regardless of the size of your home, the exterior and interior woodwork have a significant impact on the design and architectural aspect of the structure. From external siding, paneling and soffits to internal moldings and trim, there are a number of timber features that are important to the overall stability and aesthetic appeal of your home. When you are having a new project done or need to get an existing wood feature repaired or replaced, you want to hire expert carpentry contractors for the job. We at Productive Quality Construction are a property maintenance and full-service construction company situated in Atlanta, GA. Over the years, we have built a very solid customer base here and cater to clients in and around the entire metro Atlanta area. With years of general construction, remodeling and property management experience behind us, we have the experience and expertise to tackle all types of woodwork jobs with the highest levels of expertise. Carpentry requires a significant amount of training, experience, skill, knowledge, and creativity. Timber needs to be measured, cut & shaped precisely, and finished to perfection as well. Not only does this have bearing on the appearance of the structure, but on its stability as well. As a company that takes its business seriously, we recognize that every property owner wants the best features and installations for their home. We work very closely with you to understand what your ideas are, and the type of styling and design concepts you prefer. The solutions we provide will always be in line with your needs. We handle every aspect of the custom carpentry job starting from consultation and discussions, to conceptualization, design, and installation. If you are looking for high-quality, customized home or office carpentry services, Productive Quality Construction is the company to contact. Feel free to call us on 770-217-7560 and discuss your project details with one of our experts. 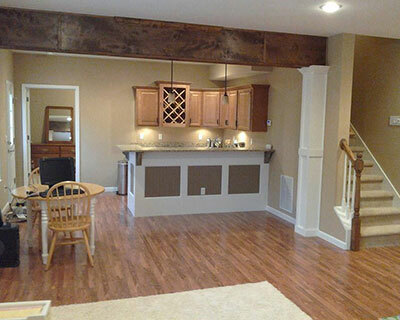 We provide end-to-end solutions at very cost-effective carpentry services cost.